The idea behind Software Modernization is to analyze existing functions of your legacy system and group them together to components. This task is called Componentization. After the Componentization you need to analyze the worked out components. Are there any similarities in the component structures and the relationship between components? 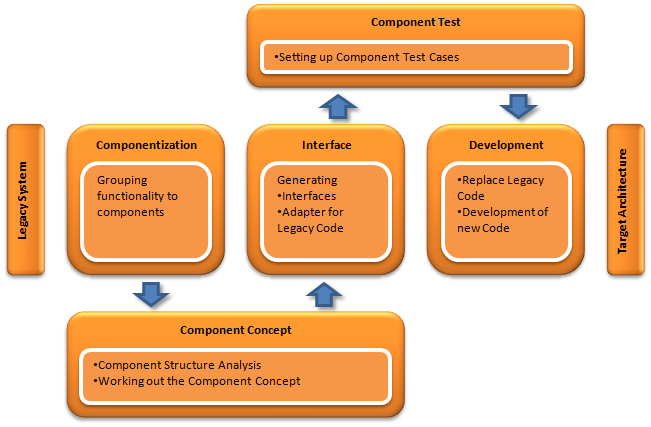 Any findings of this component analysis process will help you to define the formal component concept. Once found an adequate formal component concept of your legacy system, you are able to manage your components. Doing so allows you to generate component interfaces. These component interfaces allow you to define clear relations between components. They also make it easy to setup new functionality as managing components through a web gui (web enabling) or providing access through services (SOA enabling).